I’m not really a morning person, and I certainly don’t get out of bed for KPIs. But when I found myself singing along to a flash mob choir at the launch of Engage for Success Wales… I knew it was worth re-setting the alarm. 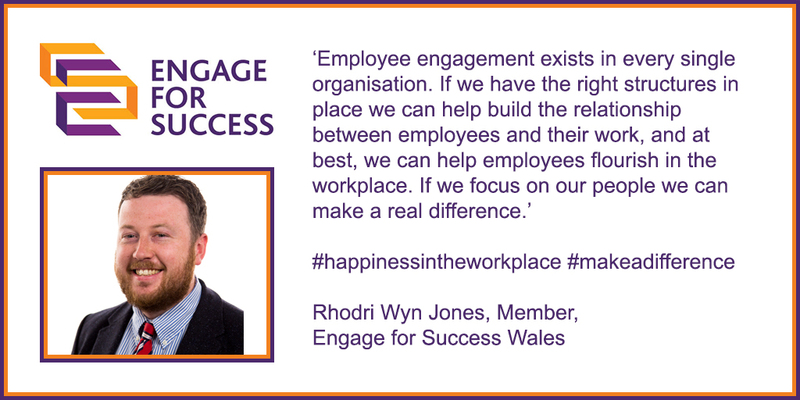 I was invited to join members from Engage for Success at the beginning of the year to help promote the importance of employee engagement in Wales, and to organise a launch event to outline our goals for the future. The launch of Engage for Success in Wales was held in the iconic Pierhead building on Tuesday, 17 October 2017 to help promote best practice in engagement and leadership. Manon Antoniazzi (Chief Executive and Clerk of the National Assembly for Wales) kicked-off the event by emphasising the importance of employee engagement to help build the ‘Wales we want’, and develop sustainable prosperity in terms of economic growth and personal well-being. I was amazed to find out that the UK productivity gap had widened to its worst level since records began, and that in Wales the labour productivity was almost 20% below the UK average. Manon wrapped up by saying that we all had a responsibility to tackle this issue head on if we wanted to achieve a prosperous Wales. All the speakers offered a valuable insight into the world of employee engagement and sparked a number of conversations around the room. There was a discussion on whether engagement is something employers do to their employees, or whether it is the emotional connection that employees have with their organisation. It was agreed to be a mixture of both, where an understanding of organisational values and behaviours help employees flourish in the workplace. Even though the Assembly achieve an engagement index score of 74% in the Civil Service People Survey, which is the highest of those organisations with their main base in Wales, I still left the event thinking of new ways to improve employee engagement, and realising that it’s something that managers and executives can influence. It was clear that we all have a responsibility to share best practice to help improve engagement if we are to drive up our productivity and prosperity in Wales. The whole event proved to be a huge success and showed that there’s a real appetite to promote employee engagement across Wales. As soon as the choir sang their last note I decided on what action I’d take from the day… to begin organising the next Engage for Success Wales event!! Written by Rhodri Wyn Jones, OD Manager at the National Assembly for Wales. If you’d like to find out more, visit the Engage for Success Wales web page.